Chris Schlechty, a Senior Software Engineer at Microsoft, makes his story of breaking into tech as a person with a disability sound rather easy. He visited the Microsoft campus as a student at a nearby high school, and there he learned about the “DO-IT program” (Disability Opportunities Internetworking Technology), run by the University of Washington, which helps people with disabilities secure careers in STEM. By his senior year of high school, he was already a participant with DO-IT and an intern at Microsoft. When he graduated college, he had an offer to come back to Microsoft full time and has remained with the company ever since. 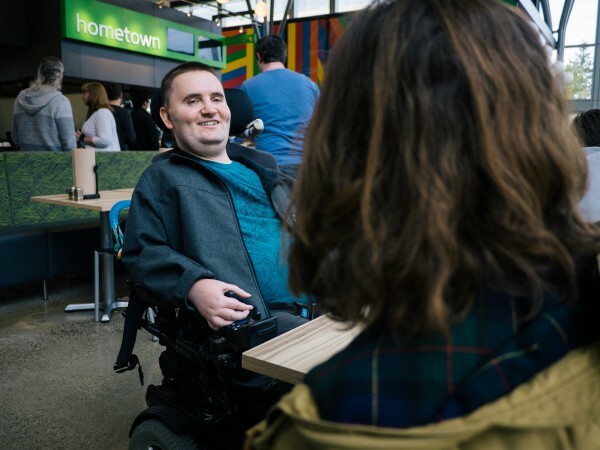 At Microsoft, where he serves as his team’s accessibility expert, he has felt accepted and welcomed from day one. His accommodations as a wheelchair rider, namely a well-organized office and an accessible desk, have always been met, and he remarks that his accommodations are treated no differently than other nondisabled team members’ needs, like working from home or being able to leave at a set time to pick up their kids. Chris’s story raises an important point that’s often forgotten when we discuss the need for more diversity in tech. Getting people like Chris, who has clearly been an asset to the company, to work in tech isn’t just about adding a disability page to a company’s website or asking recruiters to strive for more disability hires. It involves opening up the paths for disabled people in hiring, retention, and development, and sometimes, that might involve supporting social changes that go beyond the workplace. Interested in more on disability in tech? You can watch our webinar “Beyond Diversity 101: Learning from the Perspectives of People with Disabilities in Tech” now (with captioning and audio description).